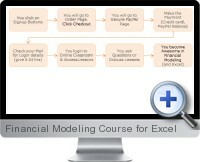 The Financial Modeling Course for Excel assumes a basic skill level of Excel to apply to the most important areas of financial modeling and analysis. The financial modeling course is self paced and designed for professionals to increase Excel skill levels if modeling for investment and commercial banking, equity research and analysis and business planning and strategy. Designing an efficient model logic and layout. Inputting data correctly for historical financial statements. Analyzing profitability and business growth drivers. Establishing line item growth assumptions. Projecting future profit and loss statement and balance sheet. Developing asset and depreciation schedules. Creating debt level and repayment schedules. Calculating shareholder equity and retained earnings. Modeling the cash flow statement and analysis. Dealing with recursive calculations and for cash flow. Establishing and analyzing financial ratios. Business valuation using the discounted cash flow (DCF) method. Company valuation by the comparable method. Charting and data visualization techniques.